Recognition from other architects is not necessarily an indicator of an all-around good and worthy church building. The Progressive Architecture awards in particular reward the type of risk-taking that may be good for the culture of architectural design but tend to sacrifice too much for design; this attitude too often leads to short-lived, poorly-constructed, and high-maintenance buildings which are terribly difficult for the end user to live with. Still, it is worthwhile to examine that which architects consider laudable. The religious/spiritual buildings found in general architectural awards are predominantly chapels. A small chapel does not have many of the practical constraints that make complex programs more practically difficult. And when the program does not call for specific liturgical uses or religious imagery, the potential arises for a highly crafted work of pure architecture. What jury of architects could refuse that? 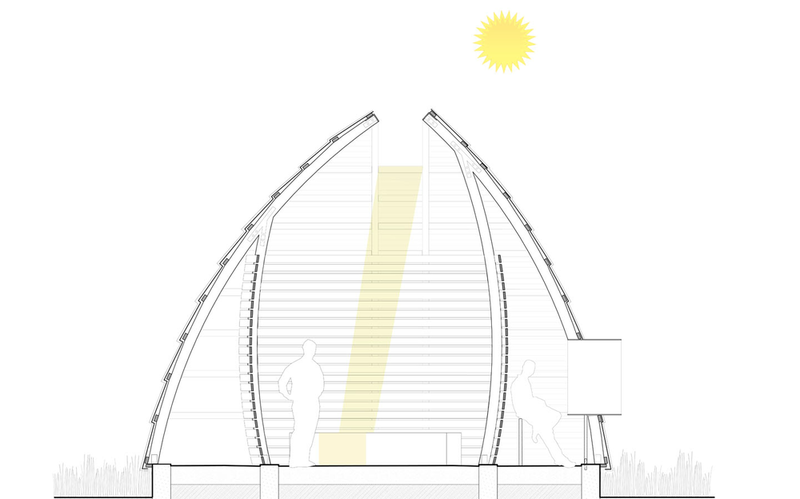 This year's 2012 P/A Awards Citations included one such chapel, an as-of-yet unbuilt project simply titled Prairie Chapel designed by Hughesumbanhowar Architects. I'm glad I took the time to make a closer examination which revealed a remarkable formal subtlety over an admirable application of vernacular re-use that is just "progressive" enough to mark itself as a place set aside. The rendered interior perspectives and sectional model help illuminate the interior somewhat. They show the layering of an unexpected convex inner volume within the concave space derived from the quonset hut. The planks forming the inner wall will be constructed from charred cedar, so they will appear more like the rendering than the model below. But it is really only the drawings that reveal the subtlety of the re-arranged geometry. The incredibly basic walls, built from a single structural radius, tilt and skew but only just. Even photographs will likely not make these formal manipulations apparent, but from reading the drawings they are just enough to exaggerate the perspective from the outside, playing against the landscape, and direct movement and focus within. It is quite an exercise in what architecture alone can do in shaping space without the overt formalism of a Chapel of Thanks-giving or the tectonic symbolism of a Bruder Klaus Feldkapelle. Without at least a hint of liturgical context, however, it is difficult to discern suitability for a specific use. It has only the most fundamental spiritual architectural tropes: opening above, concave space upward, dome/vault, path, revealed inner/outer dichotomy, protected view, etc. But perhaps that is not a problem for a rural small family chapel since it is liberated from the need to reveal itself within a broader cultural context. It may be that the chapel only truly becomes completely a chapel through the collective familial memory created by its repeated use well after the architect departs. Incidentally this is one where it would be especially informative to hear the client's take on the building and document how they end up using or even modifying it.